In spare moments between real work, I’ve been experimenting with a light weight content server for user generated content. In short, that means content in a hierarchical tree that is shallow and very wide. It doesn’t preclude deep narrow trees, but wide and shallow is what it does best. Here are some of the things I wanted to do. I wanted to support the same type of RESTfull interface as seen in Sakai OAE’s Nakamura and standards like Atom. By that I mean where the URL points to a resource, and actions expressed by the http methods, http protocol and markers in the URL modify what a RESTfull request does. In short, along the lines of the arguments in http://roy.gbiv.com/untangled/2008/rest-apis-must-be-hypertext-driven which probably drove the thinking behind Sling on which Nakamura is based. I mention Atom, simply because when you read the standard it talks about the payload of a response, but makes no mention of how the URL should be structured to get that payload. It reinforces the earlier desire. I wanted the server to start as quickly as possible, and use as little memory as possible. Ideally < 10s and < 20MB. Java applications have got a bad name for bloat but there is no reason they have to be huge to serve load. Why so small (in Java terms)? Why not, contrary to what most apps appear to do, memory is not there to waste? I wanted the request processing to be efficient. Stream all requests (commons-upload 1.2.1 with streaming, no writing to intermediate file or byte all of which involve high GC traffic and slow processing), all things only processed once and available via an Adaptable pattern, a concept strong in Sling. And requests handled by response objects, not servlets. Why ? So the response state can be thread unsafe, so a request can be suspended in memory and unbound from the thread. And the resolution binding requests to resources to responses to be handled entirely in memory by pointer avoiding iteration. Ok so the lookup of a resource might go through a cache, but the resolution through to resource is an in memory pointer operation. Where content is static, I wanted to keep it static. OS’s have file systems that are efficient at storing files, efficient at loading those file from disk and eliminating disk access completely, so if the bulk of the static files that my application needs really are static, why not use the filesystem. Many applications seem to confuse statically deterministic and dynamic. If the all possibilities of can be computed at build time, and the resources requires to create and serve are not excessive, then the content is static. Whats excessive ? A production build that takes 15 minutes to process all possibilities once a day is better than continually wasting heat and power doing it all the time. I might be a bit more extreem in that view accepting that filling a TB disk with compiled state is better than continually rebuilding that state incrementally in user facing production requests. If a deployer wants to do something special (SAN, NAS, something cloud like) with that filesystem there are plenty of options. All of Httpd/Tomcat/Jetty are capable of serving static files in high 1000s of requests per second concurrent, so why not use that ability. Browser based apps need every bit of speed they can get for static data. The downside of all of this minimalism is a server that doesn’t have lots of ways of doing the same thing. Unlike Nakamura, you can’t write JSPs or JRuby servlets. It barely uses the OSGi Event system and has none of the sophistication of Jackrabbit. The core container is Apache Felix with the the Felix HttpSerivice running a minimalist Jetty. The Content System is Sparse Content Map, the search component is Solr as an OSGi bundle. Webdav is provided by Milton and Jax-RS by RestEasy. Cacheing is provided by EhCache. It starts in 8Mb in 12s, and after load drops back to about 10MB. Additional RESTfull services are creating in one of three ways. Registering a servlet with the Felix Http Service (whiteboard), which binds to a URL, breaking the desire that nothing should bind to fixed URLs. Creating a component that provides a marker service, picked up by the OSGi extension to RestEasy that registers that service as a JAX-RS bean. Methods 1 and 2 have complete control over the protocol and are wide open to abuse, method 3 follows a processing pattern closely related to Sling. Well unit testing is obvious, we do it and we try and get 100% coverage of every use case that matters. In fact, if you work on a time an materials basis for anyone, you should read your contract carefully to work out if you have to fix mistakes at your own expense. If you do, then you will probably start writing more tests to prove your client that what you did works. Its no surprise, in other branches of Engineering, that acceptance testing is part of many contracts. I dont think an airline would take delivery of a new plane without starting the engines, or a shipping line take delivery of a super tanker without checking it floats. I am bemused that software engineers often get away with saying “its done”, when clearly its not. Sure we all make mistakes, but delivering code without test coverage is like handing over a ship that sinks. Integration testing is less obvious. In Sling there is a set of integration tests that test just about everything against a running server. Its part of the standard build but lives in its one project. Its absolutely solid and ensures that nothing builds that is broken, but as an average mortal, I found it scary since when thing did break I had to work hard to find out why. Thats why in Nakamura we wrote all integration tests in scripts. Initially bash and perl then later Ruby. With hindsight this was a huge mistake. First, you had to configure your machine to run Ruby and all the extensions needed. Not too hard on Linux, but for a time, those on OSX would wait forever for ports to finish building some base library. Dependencies gone mad. Fine if you were one of the few who created the system and pulled everything in over many months, but hell for the newcomer. Mostly, the newcomer walks away, or tweets something that everyone ignores. The devs also get off the hook. New ones dont know where to write the tests, or have to learn Ruby (replace Ruby with whatever the script is). Old devs can sweep them under the carpet and when it gets to release time ignore the fact that 10% of the tests are still broken… because the didn’t have time to maintain them 3 fridays ago at 18:45, just before they went to a party. The party where they zapped 1% of their brain cells including the ones that were remembering what they should have done at 18:49. Still they had a good time, the evening raised their morale, started a great weekend ready for the next week and besides, they had no intention of boarding the ship. So the integration testing here is done as java unit tests. If this was a c++ project they would be c++ unit tests. They are in the bundle where where the code they test is. They are run by “mvn -Pintegration test”. Even the command says what is going to happen. It starts a full instance of the server (now 12s becomes an age), or uses one thats already running and runs the tests. If your in eclipse, they can be run in eclipse, just as another test might, and being OSGi, the new code in the bundle can be redeployed to the running OSGi container. That way the dev creating the bundle can put their tests in their bundle and do integration testing with the same tools they did unit testing. No excuse. “find . -type d -name integration | grep src/test ” finds all integration tests, and by omission ships that sink. Sparse Map version 1.3 has been tagged (org.sakaiproject.nakamura.core-1.3) and released. Downloads of the source tree in Zip and TarGZ form are available from GitHub. In this release 8 issues were addressed, the details are in the issue tracker. If you find any issues, please mention them to me or, better still, add an issue to the issue tracker. Unless otherwise stated the license is Apache 2. Thanks to everyone who made this release possible. The Solr Search v1.2 bundle developed for Nakamura has been released. This is not to be confused with Apache Solr 4. The bundle wraps a snapshot version of Apache Solr 4 at revision 1162474 and exposes a number of OSGi components that allow s SolrJ client to interact with the Solr server. This release fixes a number of bugs related to concurrency and and the indexing operation identified by moving from a single threaded indexing operation to a muli threaded indexing operation. These bugs were introduced in the previous release. These were introduced by sharing a StreamingSorUpdateServer between multiple threads. Although the class is thread safe and after about June 2011 it does not hang, it does contain an internal memory based queue that asyncronously sends updates to a remote server. I should state, and you guessed it, that this only impacts situations where the Solr server being updated is not in the same JVM. The problem is that should any of the updates fail, no communication of that fact propagates back to the thread that performed the update operation. 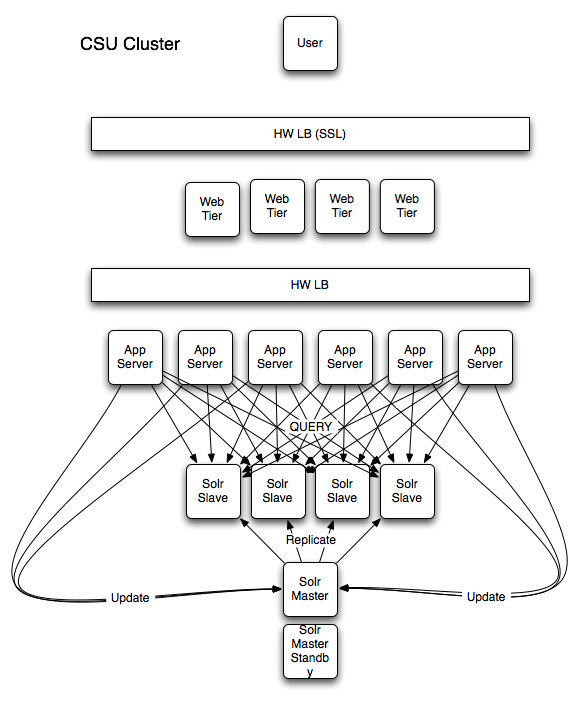 In the case of the Solr bundle we attempt to make the indexing queue reliable with a transactional, persistent queue. However, since we dont know if the update operation failed, we have no chance of working out what to do with the batch of updates being processed. This release fixes those issues. It also fixes a number of clustering and failover issues discovered at Charles Sturt University which I will leave for a follow up post. Other improvements are listed with the issues fixed against this version, link below. As always, thanks goes to everyone who contributed and helped to get this release out. Clustering Sakai OAE: Part I of ? Over the past month, on and off, I have been working with the developers at Charles Sturt University (CSU) to get Sakai OAE to cluster. The reasons they need it are obvious. Without clustering, a single instance of Sakai OAE will not scale upto the number of users they needed to support and with a single instance and SLA on uptime would be pointless. So we have to cluster. Sakai has generally been deployed in a cluster at any institution where more than a handfull of students were using the system. Clustering Sakai CLE is relatively straightforward compared to OAE. It can be done by configuring a load balancer with sticky sessions and deploying multiple app servers connecting to a single Database. However when an app server node dies with Sakai CLE, users are logged off and lose state. There are some commercial extensions to Sakai CLE using session replication with Terracotta that may address this. In Sakai OAE, right at the start of the project, we wanted to move all state into the client, and make the server completely RESTfull. No state on the server at all. We also didn’t want to have any session footprint on the server. We wanted server capacity to be a function of request traffic and not a function of number of logged in users. With no session state, we wanted to ensure that when a app server node was lost, users authentication and authorization state was recreated on whichever new app server node they were allocated. In Sakai OAE, although we are deploying with sticky sessions, we are only doing that to reduce the need for all data to appear instantly everywhere in the cluster. So the custom component that manages the authentication state and authorization state of a user has dependencies on the deployment in the cluster. The second thing we wanted to ensure when designing this area of the code base almost 2 years ago, was that we could efficiently track the location of the user within the content system. This may sound a bit odd, but it relates to the context of what they see on screen. If two users are looking at the same information at the same time, then UI components may want to encourage them to collaborate. This service also needs to be cluster aware since managing the transient location of users in persistent store would result in unsustainable update traffic. So the cluster tracking service/bundle was designed to track the location of users in memory, and segment that memory out to the app servers in the cluster, so that as we add more app servers we aggregate the memory usage for this service rather than replicate. The final area that needs attention in a clustered environment is messaging. OSGi Events for internal messaging and bridge to JMS provided by ActiveMQ for remote transport. The configuration of messaging, which I still need to look at, is believed to be simpler than the above 2 services since it only requires configuring ActiveMQ in multi master mode. I say simpler, based on the GSoC 2010 work on streaming activity events into a Apache Cassandra based warehouse where we added conected with an ActiveMQ broker in multimaster mode. However, I seem to remember saying simple about the last months work, so I’ll have to wait and see on that one. For those familiar with Sakai OAE you will know we are based on Apache Sling which itself is based on Apache Felix and Apache Jackrabbit. We use Apache Jackrabbit to store our “enterprise” content, namely the application content and institutional media. Since this is slow changing, read only, we treat each app server node as a standalone instance of Jackrabbit working of separate JCR images on local storage. This avoids the need to cluster Jackrabbit for either HA or scaling, not that it would need either of those used in this mode. We store our user generated content in a separate repository (Sparse) that is far less sophisticated than Jackrabbit, but covers that use case to satisfy our needs. At CSU the layers of the application are isolated from one another using a hardware load balancer (HLB), between each layer. IP requests are received on the front end host, distributed to a stateless webtier which does the normal forward proxy operation through another context on the HLB to the app server nodes. The tiers and LB’s are configured to maintain the original request context (Host+port), so the app server is configured to use that context to separate user content from application content. This is not the way many have configured OAE but it eliminates the need to distinguish requests based on the physical port on which they arrive. To start with we deployed the OAE 1.0 release which came out about 2 months ago. This had not been run on a cluster before release so it was uncharted territory. Having configured the WebTiers and LB contexts and the app servers all worked perfectly, however none of the services mentioned above worked properly. When an app server died, the LB would switch and cause the user to loose all state. In general they became an anonymous user once more and would have to login again. Communication in the cluster for both state management and location is managed through EhCache. As with Sakai CLE there are local EhCache caches, and key based invalidation caches. Unlike Sakai CLE we also use replication within the cluster. Since it would overload the internal network of a cluster if we replicated every users state, we dont do that. Each server maintains a list of a set of private keys which it rotates on a 5 minute cycle. Once a key has been rotated 5 times, it become invalid. We use these keys to decrypt client cookies and identify the user. If the client cookie can’t be decrypted the authentication and authorization state expires. Obviously we re-issue the cookies when a new active key becomes available. The HMAC algorithm is SHA-512 and the first keys themselves are based on a UUID, which should make it reasonable hard to work out what the secret is before it becomes useless. For each app server in the cluster we need to replicate about 5×20 bytes of data once every 5 minutes, regardless of how many users there are in the system, but if that data is not replicated, sessions can’t migrate between app servers. The location service has a slightly higher demand on internal network bandwidth, however, without having done any load testing I cant quantify that at present. This post is Part I of ? The first problem, which why the patch to OAE 1.0 is do big, is that to replicate, the cache key and payload must be serializable (which they were) but the destination of the replication the cache payload (ie the classloader deep within EhCache) must also be able to convert the byte stream into a object instance. In OAE 1.0 there were 2 problems. All the critical classes were private in their OSGi bundles, so the EhCache classloader could not load them. Getting classloaders, especially those that never knew something like OSGi would exist, to recognise private classes is not always straightforward. We are using EhCache 1.5, which uses context classloaders in places. For the moment, the classes are exported as part of the public API and the patch has re-factored parts of the code base to ensure that references to services are not cached. We could have written a custom classloader to locate the bundle containing the private classes so the cache could load them, however it felt wrong to bypass the OSGi R4 classloader policy so exporting the cached classes looked like the best way. The downside of this approach is that any bundle in the JVM can now get hold of a replicated cache, and load the once private class, but then, were not running a security manager so that could be done anyway. With the classloading issues fixed, the setup of EhCache itself is straight forward and as per the documentation now maintained by Terracotta. We use RMI based peer discovery and replication. The peer discovery uses multicast over a private group and a separate group port to ensure that we don’t accidentally join another cluster on the same subnet. Replication and invalidation is performed on a cache by cache configuration over RMI if required, and we have configured each cache by name to match its expected characteristics. Users now remain logged in when app server nodes die. Once we have the HLB configured correctly they wont notice, which opens the ability to elastically scale and perform rolling updates. We have also configured the Solr component to run in a cluster, but I will save that for another post as its not complete and there are still many problems to be addressed. Comments : Comments Off on Clustering Sakai OAE: Part I of ?